The lid was supposed to be kept on this until 3GSM next week, but Microsoft just couldn't wait to show off their Windows Mobile 6: Crossbow. How does it match up to our old Windows Mobile 5? Here are some impressions. Besides the renaming scheme we talked about already, crossbow is supposed to be faster and more stable. Also, there's going to be Windows Live integration (Search, Mail, Messenger) to bring the entire suite to the mobile space. More good news: Office Mobile will be on the Smartphone (Classic) editions now as well. Then, there's direct push calendar syncing, better formatting for Mobile Office, a 30% increase in speed for mobile IE, better Vista syncing, a better Calendar view called "Calendar ribbon", cal history, and tightened security. You can now download updates and applications via Windows Mobile Update and Windows Mobile Marketplace OTA (over the air), which makes it quite convenient to upgrade or install new apps. Plus, better contacts integration gives business users with hundreds of contacts a better way to view the Call History screen. 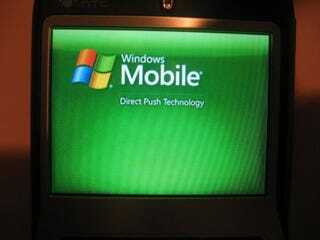 All these features add up to one pretty enticing reason for everyone to upgrade to Windows Mobile 6.